This week at the Children’s After School Art Club we made fish using old CD’s with Eau Brink Studio. Painting old CD’s and turning them into a piece of art is kids play today. The children all enjoyed painting them bright colours and adding glitters to give a little bit of extra sparkle. Two CD’s are required for this . The children then cut the fins and tail from card, which they then painted. They stuck Googly eyes on both CD’s . Once dried they glued them together with the fins and tail in between the disks. Fishing line is added to the top fin to use to hang the fish. A perfect project that takes about an hour. lots of brightly coloured fish. They would make a great mobile. All the children enjoyed this activity and took the fish home to hang in their bedrooms. A weekend with Amanda Hislop at Eau Brink Studio has been great fun and very creative. 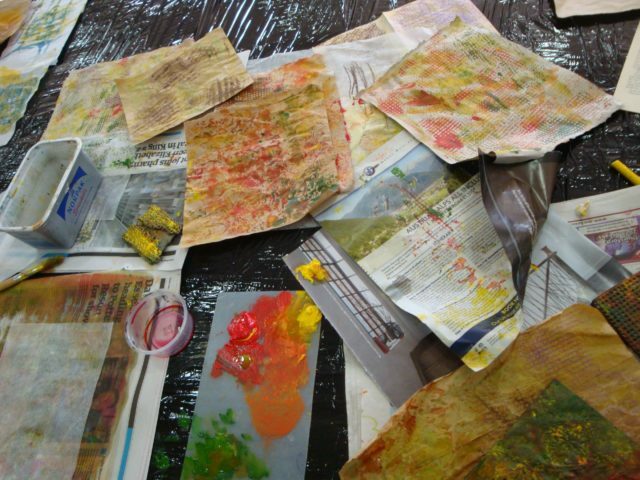 On Saturday we were learning how to create papers from recycled materials and how to use Markal paint sticks, wax crayons and candle wax as a resist to Procion dye ink and Acrylic ink washes. We were limited to only two or at a push three colours and grey or black and white. this way we could change the colours and learn how to mix them to make secondary colours as well as tints and tones. We were then shown how to use the colours on home made stamps, over rubbings and to highlight areas of our work. The collection of papers grows very quickly. 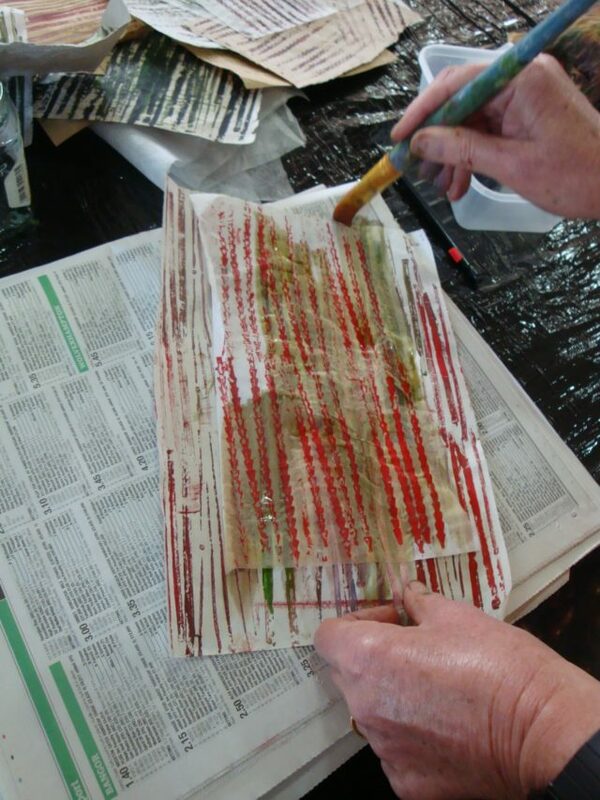 The next stage of the process was to apply the papers to muslin in strips. 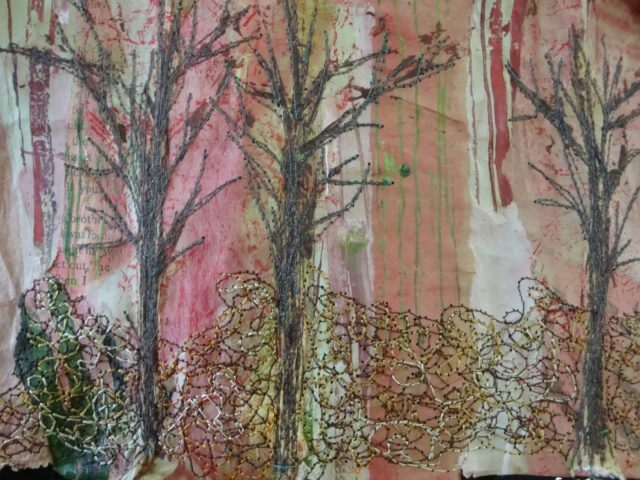 We were tearing them up and layering them to create backgrounds to sew in to. coloured papers and layers being added to muslin. The effect is amazing and once stitch is added you have a lovely landscape.. The weekend flew by and the creative buzz in the studio was amazing. Amanda moved around the room to ensure everybody was on track and the quality of the work produced was very high. Amanda bought her own hand made brooches, cards and her last book for us to purchase. She also showed us some of her finished work. Which is amazing of course. The next time Amanda is back at Eau Brink Studio is the end of summer next year where we will be put through our paces with sketch books. Amanda is going to send us out into the garden (weather permitting) to learn how to do quick sketches and us the area around us as inspiration. She will then get us using the sketchbooks for our work. Again this will be over two days at a weekend. Well I can say that this week has been so busy I am not sure how we managed it. 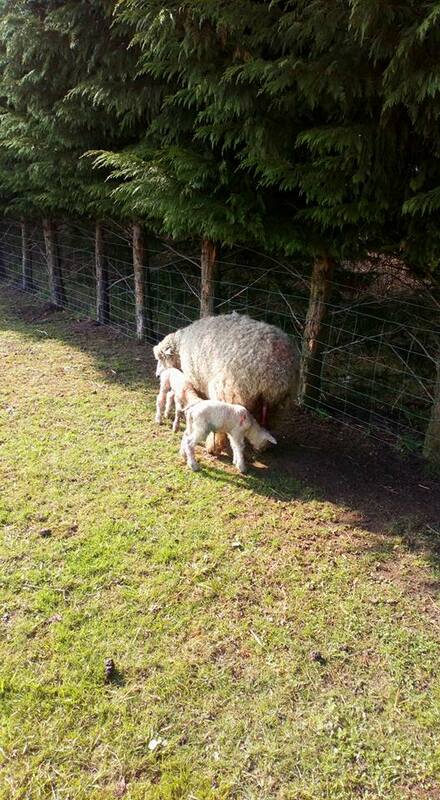 All our lambs are now born. three girls and two boys all doing well and our ladies are great mums. 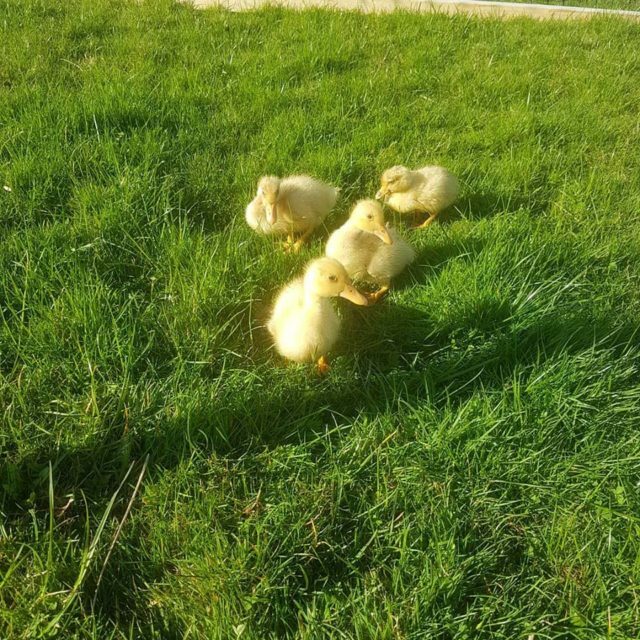 The ducklings are outside enjoying the sun and the interaction with the other fowl in the garden. 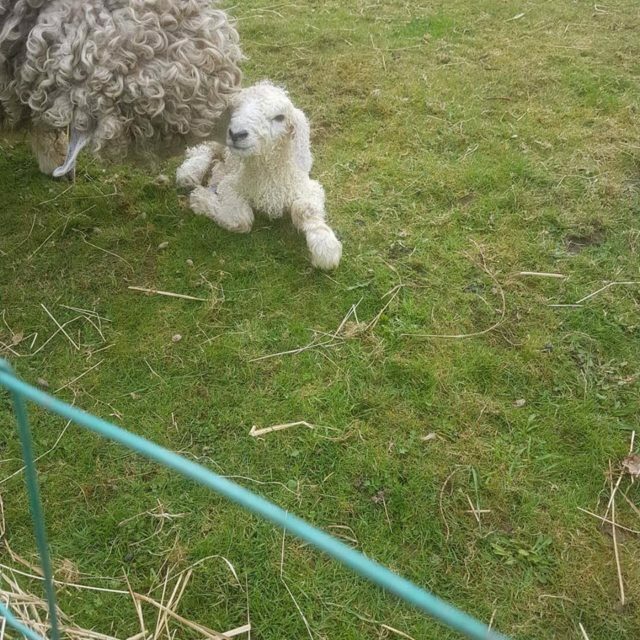 And of course our Marlow is keeping a close eye on it all.With all this new life going on I am also getting ready for Amand Hislop to arrive on Friday for the weekend. what an exciting weekend it will be and I for one cannot wait. (there is still time to book. 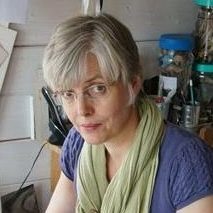 Just go to https://www.eaubrinkstudio.co.uk/event/amanda-hislop) . Also I am getting ready fro the Kirstie Allsopp Hand Made Fair in May at Ragley Hall. Three days of excitement with like minded people. Lucky John is coming with me. 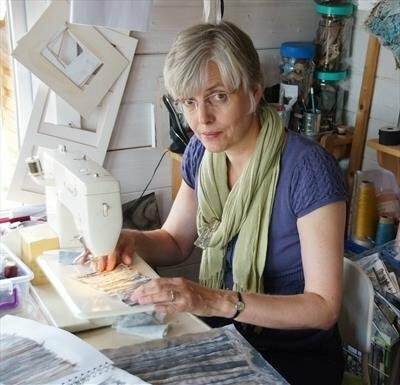 I will be taking my Sharins, lampshades, bags and other sewn items along with the Powertex brooches and two new products if I can get them finished in time. I have finished my Time and Tide pieces for the Embroiderers Guild Exhibition in June and I have a piece for the Exhibition at Thornham too. These take place during the Open Studios from 26th May to the 10th June. but more about this at a later date. The studio is a real mess at the moment with so much happening and on top of all this I have to get my accounts in for my accountant. Not a job I enjoy I have to say. One change this week in the running of our programme is the Embroidery Mondays. Rather than booking up a 6 week block you can book in for the afternoon from 2 pm till 4.30 pm. This appears to be working better than the evenings and you can book in to work on what ever you wish to learn. 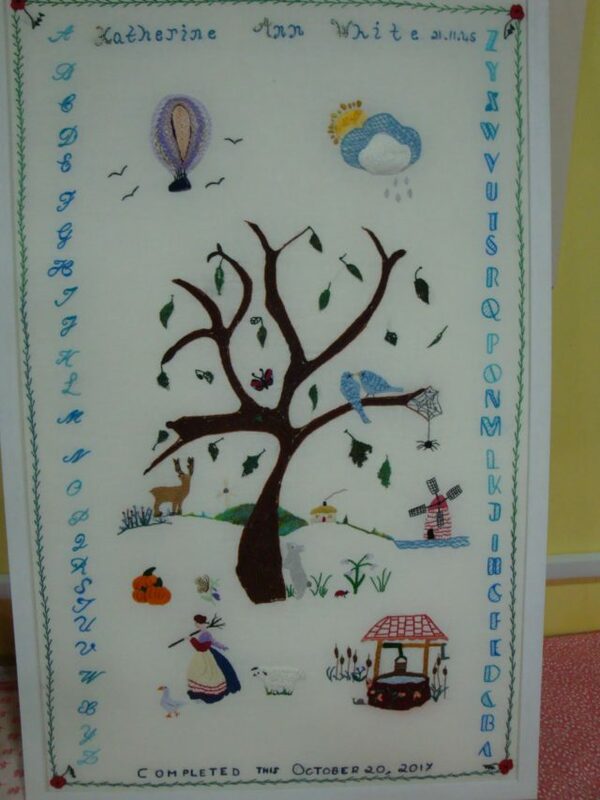 It is basic beginners embroider and you can learn at your own pace. It is open for all ages. What an exciting week we have had at Eau Brink Studio with the longer days. Our first ever lamb was born. Since then we have had a set of twins arrive and one more mum to be is in the final stages of her pregancy. I cannot wait to see the wool grow and the first locks to get to dye and spin. I may send some away to be professional spun to see how soft it is. Lambs are not the only new arrivals we have ducklings too. This means loads of feathers for us to use in the workshops as it brings our total of ducks to ten. That’s a lot of feathers. All this is very lovely but I also have been sewing like mad getting ready for the Kirstie Allsopp show. 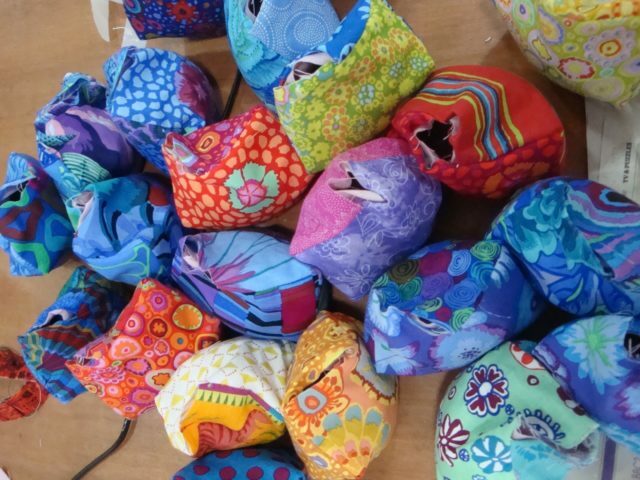 First items to be finished are zippy bags. Pleased with box pleats to give a great shape and lots of room for your goodies to go in. fully lined of course. The next items being made are the Sharpins. These have been filled and are ready for sewing up and buttons added. 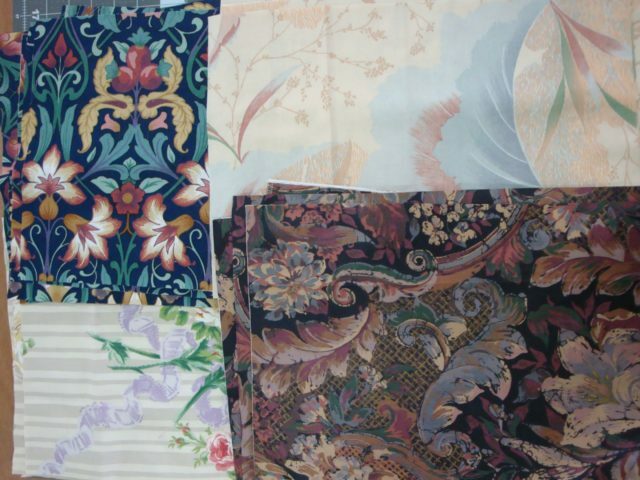 Sharpins using Kaffe Fassett fabrics. Just waiting for the final sewing up and buttons. Now cut ready for sewing are the scissor holders which will have bright coloured scissors added of course. fabric cut ready for sewing into scissor holders. Open Studios is almost upon us. Two weeks of visiting others studios and seeing all of the fantastic work on offer. We in West Norfolk have a huge amount of talent in many different arts and would love to see visitors during this time. I hope you like this weeks news. Please do feel free to share it with anyone who you feel may be interested in this information. Be inspired and Create fabulous works.